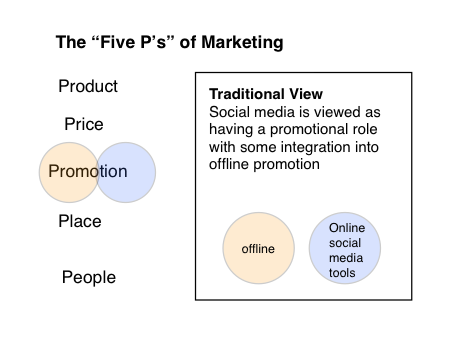 For the past few months I have been writing about a vision of social media where social networks are not the only playing fields and where social media’s place within the marketing mix does not exist entirely within “online promotion”. Understanding that people have different learning styles and different starting points, I used pen, paper and elementary venn diagrams in a meeting with “traditional” marketers to illustrate where the “online” and “social media” elements fit into their marketing world. Although simplistic and elementary, they helped them get over their initial block as to the “why, where and how” of social media. Writing down the “five P’s of marketing” I asked them to circle where they saw social media having a role to play within the marketing mix. Below is a tidied up representation of what they produced. 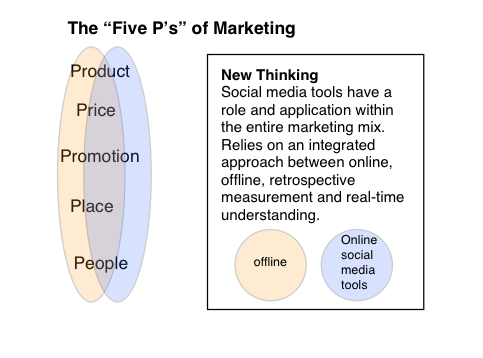 Taking the same “five P’s” I added my interpretation of where social media tools and thinking apply to the marketing mix. This opened up the discussion as to how an integrated marketing plan, using “traditional” and “new” tools adds value to an organisation. It was able to break down the resistance to social media. After further discussion, they could see how having access to real-time information and knowledge adds value when used in conjunction with retrospective measurement and information gathering tools. It also allowed the penny to drop that opening up and fostering collaboration and engagement can actually help grow an organisations IP, not loose it. As a ‘traditional’ marketer, I can appreciate why social media experts appear to us simply as online PR consultants. From my perception, I ask how does social networking Online create the consumer desire to take that all important final leap, i.e. buy the product or service in question? online social networking is a growing phenomenon, but it cannot be classified as the new, or latest miracle that will enhance the bottom line. Alasdair is correct in my opinion when he implies that traditional and new media marketing should combine the most effective elements of both practices in the common interests of both the consumers and the organization. This blog has shown me how social media can supply a fresh set of productive tools to enhance and integrate the combined marketing mix. For me it’s not new verses old, rather new and old combined. Promotion needs to concentrate on the unique selling point / differentiator of the product you are selling, so this would be promotion through media (the choice of which depends on place ? ie internet, leaflets, direct sales force, tv etc etc) with a strong emphasis on the reliability, durability and quality of the desk drawer slide ? heavily focussing on the life of the product compared to cheaper ones; a ?lifespan? comparison could show the cheaper one to be a false economy both in cost and effort of replacement, so this could communicate it quite well.Hope this helps 🙂 Thank you for this article!